John Locke FRS (/ˈlɒk/; 29 August 1632 – 28 October 1704) was an English philosopher and physician, widely regarded as one of the most influential of Enlightenment thinkers and commonly known as the "Father of Liberalism". Considered one of the first of the British empiricists, following the tradition of Sir Francis Bacon, he is equally important to social contract theory. His work greatly affected the development of epistemology and political philosophy. His writings influenced Voltaire and Jean-Jacques Rousseau, many Scottish Enlightenment thinkers, as well as the American revolutionaries. His contributions to classical republicanism and liberal theory are reflected in the United States Declaration of Independence. Locke's theory of mind is often cited as the origin of modern conceptions of identity and the self, figuring prominently in the work of later philosophers such as David Hume, Rousseau, and Immanuel Kant. Locke was the first to define the self through a continuity of consciousness. He postulated that, at birth, the mind was a blank slate or tabula rasa. Contrary to Cartesian philosophy based on pre-existing concepts, he maintained that we are born without innate ideas, and that knowledge is instead determined only by experience derived from sense perception. This is now known as empiricism. An example of Locke's belief in Empiricism can be seen in his quote, "whatever I write, as soon as I discover it not to be true, my hand shall be the forwardest to throw it into the fire." This shows the ideology of science in his observations in that something must be capable of being tested repeatedly and that nothing is exempt from being disproven. Challenging the work of others, Locke is said to have established the method of introspection, or observing the emotions and behaviours of one’s self. Locke's father, also called John, was a country lawyer and clerk to the Justices of the Peace in Chew Magna, who had served as a captain of cavalry for the Parliamentarian forces during the early part of the English Civil War. His mother was Agnes Keene. Both parents were Puritans. Locke was born on 29 August 1632, in a small thatched cottage by the church in Wrington, Somerset, about 12 miles from Bristol. He was baptised the same day. Soon after Locke's birth, the family moved to the market town of Pensford, about seven miles south of Bristol, where Locke grew up in a rural Tudor house in Belluton. In 1647, Locke was sent to the prestigious Westminster School in London under the sponsorship of Alexander Popham, a member of Parliament and his father's former commander. After completing studies there, he was admitted to Christ Church, Oxford, in the autumn of 1652 at the age of twenty. The dean of the college at the time was John Owen, vice-chancellor of the university. Although a capable student, Locke was irritated by the undergraduate curriculum of the time. He found the works of modern philosophers, such as René Descartes, more interesting than the classical material taught at the university. Through his friend Richard Lower, whom he knew from the Westminster School, Locke was introduced to medicine and the experimental philosophy being pursued at other universities and in the Royal Society, of which he eventually became a member. Locke was awarded a bachelor's degree in February 1656 and a master's degree in June 1658. He obtained a bachelor of medicine in February 1675, having studied medicine extensively during his time at Oxford and worked with such noted scientists and thinkers as Robert Boyle, Thomas Willis, Robert Hooke and Richard Lower. In 1666, he met Lord Anthony Ashley Cooper, 1st Earl of Shaftesbury, who had come to Oxford seeking treatment for a liver infection. Cooper was impressed with Locke and persuaded him to become part of his retinue. Locke had been looking for a career and in 1667 moved into Shaftesbury's home at Exeter House in London, to serve as Lord Ashley's personal physician. In London, Locke resumed his medical studies under the tutelage of Thomas Sydenham. Sydenham had a major effect on Locke's natural philosophical thinking – an effect that would become evident in An Essay Concerning Human Understanding. Locke's medical knowledge was put to the test when Shaftesbury's liver infection became life-threatening. Locke coordinated the advice of several physicians and was probably instrumental in persuading Shaftesbury to undergo surgery (then life-threatening itself) to remove the cyst. Shaftesbury survived and prospered, crediting Locke with saving his life. During this time, Locke served as Secretary of the Board of Trade and Plantations and Secretary to the Lords Proprietor of Carolina, which helped to shape his ideas on international trade and economics. Shaftesbury, as a founder of the Whig movement, exerted great influence on Locke's political ideas. Locke became involved in politics when Shaftesbury became Lord Chancellor in 1672. Following Shaftesbury's fall from favour in 1675, Locke spent some time travelling across France as tutor and medical attendant to Caleb Banks. He returned to England in 1679 when Shaftesbury's political fortunes took a brief positive turn. Around this time, most likely at Shaftesbury's prompting, Locke composed the bulk of the Two Treatises of Government. While it was once thought that Locke wrote the Treatises to defend the Glorious Revolution of 1688, recent scholarship has shown that the work was composed well before this date. The work is now viewed as a more general argument against absolute monarchy (particularly as espoused by Robert Filmer and Thomas Hobbes) and for individual consent as the basis of political legitimacy. Although Locke was associated with the influential Whigs, his ideas about natural rights and government are today considered quite revolutionary for that period in English history. Locke fled to the Netherlands in 1683, under strong suspicion of involvement in the Rye House Plot, although there is little evidence to suggest that he was directly involved in the scheme. The philosopher and novelist Rebecca Newberger Goldstein argues that during his five years in Holland, Locke chose his friends "from among the same freethinking members of dissenting Protestant groups as Spinoza's small group of loyal confidants. [Baruch Spinoza had died in 1677.] Locke almost certainly met men in Amsterdam who spoke of the ideas of that renegade Jew who... insisted on identifying himself through his religion of reason alone." While she says that "Locke's strong empiricist tendencies" would have "disinclined him to read a grandly metaphysical work such as Spinoza's Ethics, in other ways he was deeply receptive to Spinoza's ideas, most particularly to the rationalist's well thought out argument for political and religious tolerance and the necessity of the separation of church and state." In the Netherlands, Locke had time to return to his writing, spending a great deal of time re-working the Essay and composing the Letter on Toleration. Locke did not return home until after the Glorious Revolution. Locke accompanied William of Orange's wife back to England in 1688. The bulk of Locke's publishing took place upon his return from exile – his aforementioned Essay Concerning Human Understanding, the Two Treatises of Civil Government and A Letter Concerning Toleration all appearing in quick succession. Locke's close friend Lady Masham invited him to join her at the Mashams' country house in Essex. Although his time there was marked by variable health from asthma attacks, he nevertheless became an intellectual hero of the Whigs. During this period he discussed matters with such figures as John Dryden and Isaac Newton. He died on 28 October 1704, and is buried in the churchyard of the village of High Laver, east of Harlow in Essex, where he had lived in the household of Sir Francis Masham since 1691. Locke never married nor had children. Events that happened during Locke's lifetime include the English Restoration, the Great Plague of London and the Great Fire of London. He did not quite see the Act of Union of 1707, though the thrones of England and Scotland were held in personal union throughout his lifetime. Constitutional monarchy and parliamentary democracy were in their infancy during Locke's time. In the late 17th and early 18th centuries, Locke's Two Treatises were rarely cited. Historian Julian Hoppit said of the book, "except among some Whigs, even as a contribution to the intense debate of the 1690s it made little impression and was generally ignored until 1703 (though in Oxford in 1695 it was reported to have made 'a great noise')". John Kenyon, in his study of British political debate from 1689 to 1720, has remarked that Locke's theories were "mentioned so rarely in the early stages of the [Glorious] Revolution, up to 1692, and even less thereafter, unless it was to heap abuse on them" and that "no one, including most Whigs, [were] ready for the idea of a notional or abstract contract of the kind adumbrated by Locke". In contrast, Kenyon adds that Algernon Sidney's Discourses Concerning Government were "certainly much more influential than Locke's Two Treatises". In the 50 years after Queen Anne's death in 1714, the Two Treatises were reprinted only once (except in the collected works of Locke). However, with the rise of American resistance to British taxation, the Second Treatise gained a new readership; it was frequently cited in the debates in both America and Britain. The first American printing occurred in 1773 in Boston. 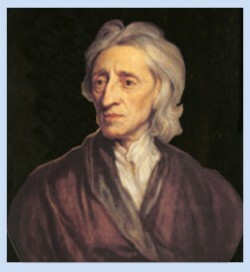 Locke exercised a profound influence on political philosophy, in particular on modern liberalism. Michael Zuckert has argued that Locke launched liberalism by tempering Hobbesian absolutism and clearly separating the realms of Church and State. He had a strong influence on Voltaire who called him "le sage Locke". His arguments concerning liberty and the social contract later influenced the written works of Alexander Hamilton, James Madison, Thomas Jefferson, and other Founding Fathers of the United States. In fact, one passage from the Second Treatise is reproduced verbatim in the Declaration of Independence, the reference to a "long train of abuses". Such was Locke's influence that Thomas Jefferson wrote: "Bacon, Locke and Newton... I consider them as the three greatest men that have ever lived, without any exception, and as having laid the foundation of those superstructures which have been raised in the Physical and Moral sciences". But Locke's influence may have been even more profound in the realm of epistemology. Locke redefined subjectivity, or self, and intellectual historians such as Charles Taylor and Jerrold Seigel argue that Locke's An Essay Concerning Human Understanding (1690) marks the beginning of the modern Western conception of the self. Locke, writing his Letters Concerning Toleration (1689–1692) in the aftermath of the European wars of religion, formulated a classic reasoning for religious tolerance. Three arguments are central: (1) Earthly judges, the state in particular, and human beings generally, cannot dependably evaluate the truth-claims of competing religious standpoints; (2) Even if they could, enforcing a single "true religion" would not have the desired effect, because belief cannot be compelled by violence; (3) Coercing religious uniformity would lead to more social disorder than allowing diversity. With regard to his position on religious tolerance, Locke was influenced by Baptist theologians like John Smyth and Thomas Helwys, who had published tracts demanding freedom of conscience in the early 17th century. Baptist theologian Roger Williams founded the colony Rhode Island in 1636, where he combined a democratic constitution with unlimited religious freedom. His tract The Bloody Tenent of Persecution for Cause of Conscience (1644), which was widely read in the mother country, was a passionate plea for absolute religious freedom and the total separation of church and state. Freedom of conscience had had high priority on the theological, philosophical and political agenda, since Martin Luther refused to recant his beliefs before the Diet of the Holy Roman Empire at Worms in 1521, unless he would be proved false by the Bible. Appraisals of Locke have often been tied to appraisals of liberalism in general, and to appraisals of the United States. Detractors note that (in 1671) he was a major investor in the English slave-trade through the Royal African Company. In addition, he participated in drafting the Fundamental Constitutions of Carolina while Shaftesbury's secretary, which established a feudal aristocracy and gave a master absolute power over his slaves. For example, Martin Cohen notes that Locke, as a secretary to the Council of Trade and Plantations (1673–1674) and a member of the Board of Trade (1696–1700), was in fact, "one of just half a dozen men who created and supervised both the colonies and their iniquitous systems of servitude". Some see his statements on unenclosed property as having been intended to justify the displacement of the Native Americans. Because of his opposition to aristocracy and slavery in his major writings, he is accused of hypocrisy and racism, or of caring only for the liberty of English capitalists. Locke also drafted implementing instructions for the Carolina colonists designed to ensure that settlement and development was consistent with the Fundamental Constitutions. Collectively, these documents are known as the Grand Model for the Province of Carolina. Locke uses the word property in both broad and narrow senses. In a broad sense, it covers a wide range of human interests and aspirations; more narrowly, it refers to material goods. He argues that property is a natural right and it is derived from labour. In Chapter V of his Second Treatise, Locke argues that the individual ownership of goods and property is justified by the labour exerted to produce those goods or utilise property to produce goods beneficial to human society. Locke stated his belief, in his Second Treatise, that nature on its own provides little of value to society, implying that the labour expended in the creation of goods gives them their value. This position can be seen as a labour theory of value. From this premise, Locke developed a labour theory of property, namely that ownership of property is created by the application of labour. In addition, he believed that property precedes government and government cannot "dispose of the estates of the subjects arbitrarily." Karl Marx later critiqued Locke's theory of property in his own social theory. Locke's political theory was founded on social contract theory. Unlike Thomas Hobbes, Locke believed that human nature is characterised by reason and tolerance. Like Hobbes, Locke believed that human nature allowed people to be selfish. This is apparent with the introduction of currency. In a natural state all people were equal and independent, and everyone had a natural right to defend his "Life, health, Liberty, or Possessions". Most scholars trace the phrase "life, liberty, and the pursuit of happiness," in the American Declaration of Independence, to Locke's theory of rights, though other origins have been suggested. Like Hobbes, Locke assumed that the sole right to defend in the state of nature was not enough, so people established a civil society to resolve conflicts in a civil way with help from government in a state of society. However, Locke never refers to Hobbes by name and may instead have been responding to other writers of the day. Locke also advocated governmental separation of powers and believed that revolution is not only a right but an obligation in some circumstances. These ideas would come to have profound influence on the Declaration of Independence and the Constitution of the United States. According to Locke, unused property is wasteful and an offence against nature, but, with the introduction of "durable" goods, men could exchange their excessive perishable goods for goods that would last longer and thus not offend the natural law. In his view, the introduction of money marks the culmination of this process, making possible the unlimited accumulation of property without causing waste through spoilage. He also includes gold or silver as money because they may be "hoarded up without injury to anyone,"since they do not spoil or decay in the hands of the possessor. In his view, the introduction of money eliminates the limits of accumulation. Locke stresses that inequality has come about by tacit agreement on the use of money, not by the social contract establishing civil society or the law of land regulating property. Locke is aware of a problem posed by unlimited accumulation but does not consider it his task. He just implies that government would function to moderate the conflict between the unlimited accumulation of property and a more nearly equal distribution of wealth; he does not identify which principles that government should apply to solve this problem. However, not all elements of his thought form a consistent whole. For example, labour theory of value of the Two Treatises of Government stands side by side with the demand-and-supply theory developed in a letter he wrote titled Some Considerations on the Consequences of the Lowering of Interest and the Raising of the Value of Money. Moreover, Locke anchors property in labour but in the end upholds the unlimited accumulation of wealth. Locke's general theory of value and price is a supply and demand theory, which was set out in a letter to a Member of Parliament in 1691, titled Some Considerations on the Consequences of the Lowering of Interest and the Raising of the Value of Money. He refers to supply as "quantity" and demand as "rent". "The price of any commodity rises or falls by the proportion of the number of buyer and sellers," and "that which regulates the price... [of goods] is nothing else but their quantity in proportion to their rent." The quantity theory of money forms a special case of this general theory. His idea is based on "money answers all things" (Ecclesiastes) or "rent of money is always sufficient, or more than enough," and "varies very little..." Locke concludes that as far as money is concerned, the demand is exclusively regulated by its quantity, regardless of whether the demand for money is unlimited or constant. He also investigates the determinants of demand and supply. For supply, he explains the value of goods as based on their scarcity and ability to be exchanged and consumed. He explains demand for goods as based on their ability to yield a flow of income. Locke develops an early theory of capitalisation, such as land, which has value because "by its constant production of saleable commodities it brings in a certain yearly income." He considers the demand for money as almost the same as demand for goods or land; it depends on whether money is wanted as medium of exchange. As a medium of exchange, he states that "money is capable by exchange to procure us the necessaries or conveniences of life," and for loanable funds, "it comes to be of the same nature with land by yielding a certain yearly income... or interest." Locke distinguishes two functions of money, as a "counter" to measure value, and as a "pledge" to lay claim to goods. He believes that silver and gold, as opposed to paper money, are the appropriate currency for international transactions. Silver and gold, he says, are treated to have equal value by all of humanity and can thus be treated as a pledge by anyone, while the value of paper money is only valid under the government which issues it. Locke argues that a country should seek a favourable balance of trade, lest it fall behind other countries and suffer a loss in its trade. Since the world money stock grows constantly, a country must constantly seek to enlarge its own stock. Locke develops his theory of foreign exchanges, in addition to commodity movements, there are also movements in country stock of money, and movements of capital determine exchange rates. He considers the latter less significant and less volatile than commodity movements. As for a country's money stock, if it is large relative to that of other countries, he says it will cause the country's exchange to rise above par, as an export balance would do. He also prepares estimates of the cash requirements for different economic groups (landholders, labourers and brokers). In each group he posits that the cash requirements are closely related to the length of the pay period. He argues the brokers – middlemen – whose activities enlarge the monetary circuit and whose profits eat into the earnings of labourers and landholders, have a negative influence on both personal and the public economy to which they supposedly contribute. Locke defines the self as "that conscious thinking thing, (whatever substance, made up of whether spiritual, or material, simple, or compounded, it matters not) which is sensible, or conscious of pleasure and pain, capable of happiness or misery, and so is concerned for itself, as far as that consciousness extends". He does not, however, ignore "substance", writing that "the body too goes to the making the man." In his Essay, Locke explains the gradual unfolding of this conscious mind. Arguing against both the Augustinian view of man as originally sinful and the Cartesian position, which holds that man innately knows basic logical propositions, Locke posits an "empty" mind, a tabula rasa, which is shaped by experience; sensations and reflections being the two sources of all our ideas. Locke's Some Thoughts Concerning Education is an outline on how to educate this mind: he expresses the belief that education maketh the man, or, more fundamentally, that the mind is an "empty cabinet", with the statement, "I think I may say that of all the men we meet with, nine parts of ten are what they are, good or evil, useful or not, by their education." Locke also wrote that "the little and almost insensible impressions on our tender infancies have very important and lasting consequences." He argued that the "associations of ideas" that one makes when young are more important than those made later because they are the foundation of the self: they are, put differently, what first mark the tabula rasa. In his Essay, in which both these concepts are introduced, Locke warns against, for example, letting "a foolish maid" convince a child that "goblins and sprites" are associated with the night for "darkness shall ever afterwards bring with it those frightful ideas, and they shall be so joined, that he can no more bear the one than the other." This theory came to be called "associationism", and it strongly influenced 18th-century thought, particularly educational theory, as nearly every educational writer warned parents not to allow their children to develop negative associations. It also led to the development of psychology and other new disciplines with David Hartley's attempt to discover a biological mechanism for associationism in his Observations on Man (1749). Locke was critical of the Descartes' dream argument saying that you cannot feel pain while dreaming. Various scientific study findings conducted within the last few decades say that pain in dreams can occur in contrast to Locke's claim. Some scholars have seen Locke's political convictions as deriving from his religious beliefs. Locke's religious trajectory began in Calvinist trinitarianism, but by the time of the Reflections (1695) Locke was advocating not just Socinian views on tolerance but also Socinian Christology. However Wainwright (1987) notes that in the posthumously published Paraphrase (1707) Locke's interpretation of one verse, Ephesians 1:10, is markedly different from that of Socinians like Biddle, and may indicate that near the end of his life Locke returned nearer to an Arian position, thereby accepting Christ's pre-existence. In fact, historian John Marshall suggests that Locke's view of Christ ended, "somewhere between Socianism and Arianism." Locke was at times not sure about the subject of original sin, so he was accused of Socianism, Arianism, or Deism. But he did not deny the reality of evil. Man was capable of waging unjust wars and committing crimes. Criminals had to be punished, even with the death penalty. With regard to the Bible Locke was very conservative. He retained the doctrine of the verbal inspiration of the Scriptures. The miracles were proofs of the divine nature of the biblical message. Locke was convinced that the entire content of the Bible was in agreement with human reason (The reasonableness of Christianity, 1695). Although Locke was an advocate of tolerance, he urged the authorities not to tolerate atheism, because he thought the denial of God's existence would undermine the social order and lead to chaos. That excluded all atheistic varieties of philosophy and all attempts to deduce ethics and natural law from purely secular premises, for example, man's "autonomy or dignity or human flourishing". In Locke's opinion the cosmological argument was valid and proved God's existence. His political thought was based on "a particular set of Protestant Christian assumptions." Locke's concept of man started with the belief in creation. We have been "sent into the World by [God's] order, and about his business, [we] are his Property, whose Workmanship [we] are, made to last during his, not one anothers Pleasure." Like the two other very influential natural-law philosophers, Hugo Grotius and Samuel Pufendorf, Locke equated natural law with the biblical revelation, since in their view both had originated in God and could therefore not contradict each other. "As a philosopher, Locke was intensely interested in Christian doctrine, and in the Reasonableness he insisted that most men could not hope to understand the detailed requirements of the law of nature without the assistance of the teachings and example of Jesus." Locke derived the fundamental concepts of his political theory from biblical texts, in particular from Genesis 1 and 2 (creation), the Decalogue (Exodus 20), the Golden Rule (Matthew 7:12), the teachings of Jesus (e.g. his doctrine of charity, Matthew 19:19), and the letters of Paul the Apostle. The Decalogue (Ten Commandments) puts a person's life, his or her honourable reputation (i.e. honour and dignity), and property under God's protection. Freedom is another major theme in the Old Testament. For instance, God's actions in liberating the Israelites from Egyptian slavery in the Decalogue's prologue (Exodus 20:2) were the precondition for the following commandments. Moreover, Locke derived basic human equality, including the equality of the sexes ("Adam and Eve") from Genesis 1:26–28, the starting point of the theological doctrine of Imago Dei. To Locke, one of the consequences of the principle of equality was that all humans were created equally free and therefore governments needed the consent of the governed. Only when Locke had derived the fundamental aspects of his concept of man and ethics from the biblical texts – life, equality, private property, etc. –, did he examine as a philosopher which consequences they had in the abovementioned way. Following Locke, the American Declaration of Independence founded human rights partially on the biblical belief in creation: "All men are created equal, (...) they are endowed by their Creator with certain unalienable rights, (...) life, liberty, and the pursuit of happiness." Locke's doctrine that governments need the consent of the governed is also central to the Declaration of Independence.